This prickly wildflower is not in fact a member of the dock family; it belongs to the daisy family, Asteraceae. Burdocks bloom from July until September, and they are generally found in shady places or on waste ground. Typically, the plant grows to a metre, with flower heads between 15 mm and 30 mm in diameter with florets that extend well beyond the tips of the surrounding bracts. The seed heads, or burs, have hooked bracts and become attached to the fur of animals; in this way the seeds are distributed. 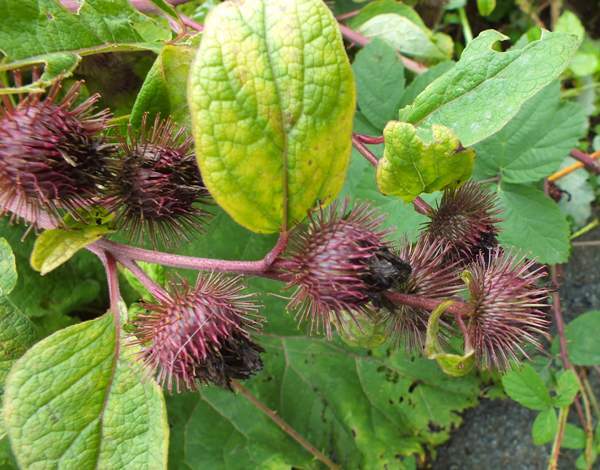 Leaves of Lesser Burdock are alternate; they are oval or cordate and finely toothed. Another burdock that you will find in Wales and throughout the UK is the Greater Burdock, Arctium lappa. 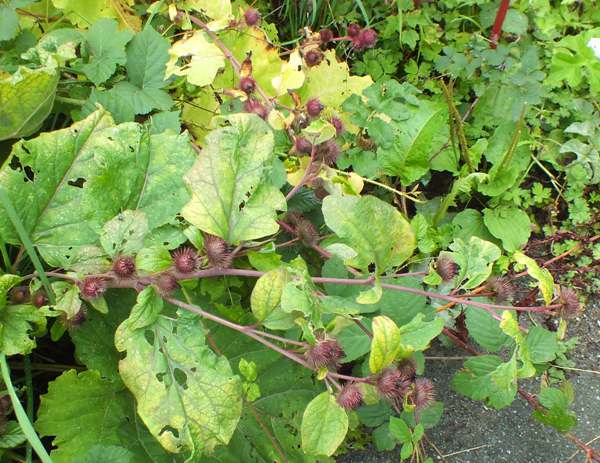 It is very similar to lesser burdock, but has more lanceolate or triangular leaves that are coarsely toothed; and it has rounder, somewhat larger flowers. The flowers of Great Burdock can be up to 40 mm in diameter and do not extend significantly beyond the surrounding bracts. The plants shown on this page were photographed in Wales.